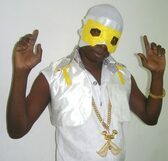 Le Maxque is his showbiz name.The reason, he wears a mask as his identity, challenging Artists image presentation in Ghana.This mask concept has embodied his real identity into some interesting mystery as to who he is and who he is not. His Band The Volta Dance Ensemble has also singled themselves out to be a unique and indigenous group that showcase contemporary and traditional ayigbe music from the volta region of Ghana in an amazing performance.Traditional & Contemporary ayigbe music in Ghana has come a long way but has no international exposure until Le Maxque and The Volta Dance Ensemble came onto the scene. Le Maxque is the current Breast & Cervical Cancer Ambassador in Ghana..gearing up to set up the first free breast screening center in Ghana. 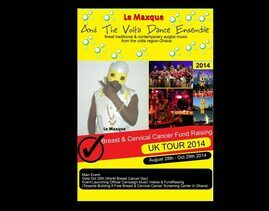 Le Maxque & The Volta Dance Ensemble ends 2013 UK Tour .The group returns home safely after a 3 months successful tour in the United Kingdom. The tour has become paramount due to the increasing deaths caused by the dreadful infectious Breast & Cervical Cancer.The tour is intended to give Le Maxque,the ambassador an international platform to launch his newest video for the campaign and raise funds for building the proposed Free Breast & Cervical Cancer Screening Center in Ghana.The UK Tour is supported by The Ghana Society UK.